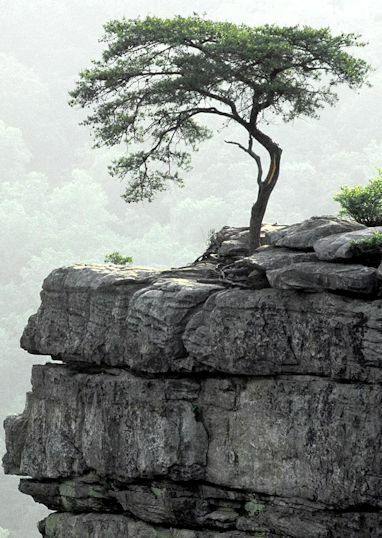 The tree that grows upon the rocky cliff is the symbol of perseverance, determination, and persistence. Some bird might have dropped the seed of the tree while resting on the cliff or wind must have carried it there. Anyway, the seed did not choose the location on its own. The choice was made for it. When the rain came it germinated, put out its roots and started growing. Small leaves sprouted and started making food for it to grow. But on the mountain top, soil, water, and minerals necessary for growth were scarce. The soil was not very fertile and water was not easily available. The plant used the soil particles brought by wind, water drops brought by the occasional rain and minerals and nutrients from the bird droppings and the waste left by other animals. Since the resources were very limited it didn’t grow very fast or very big. It spent more energy on survival and focused more on establishing itself on the cliff among the rocks—in a hostile environment. It sent its roots deep and far in search of water and for purchase so that wind would not blow it away. Growing and spreading through granite is very difficult, but it tried and eventually succeeded. Its search for water sometimes, no many times, ended in failure. But the plant didn’t consider those efforts as waste. Roots that could not find water helped in anchoring the plant strongly. When luck favored, some roots found a water reservoir trapped in the rocks. It gave the plant materials needed to make food. Some of it was consumed for growth, some of it was stored for the dry season. The plant too had ambitions to grow big like other trees. But it knew that its smaller size was it its strength. If it had grown big and tall, it would have fallen as it wouldn’t have had enough strength and anchorage to battle the strong winds it had to face on the cliff every day. Happy 2016, Alexis! Very happy to read your new post. Enjoyed it. Thank you. A truly lovely, insightful composition. And definitely a thought to ponder on as we start another year. The accompanying photo is a perfect complement, was the image an inspiration for the writing or was it the other way around? Wishing you a wonderful, blessed new year, Alexis. Good to see you back on your blog. Martin: Thanks for the wishes. I too wish you and happy, healthy, and prosperous 2016. Vandana:Thanks Vandana. You guessed right. The photo was the inspiration to write. How did you guess? Thanks for the wishes. I too wish you a wonderful 2016. May God bless you and family with the best of everything in life. Beautiful. A story worth reading. ‘Anyway, the seed did not choose the location on its own. The choice was made for it.’ Yes, Alex. Your observation is perfect. I have always felt that our lives are plays directed by someone behind the back curtain. We, the actors may have been given the freedom to improvise to some extent. But the major twists and climax are in the hands of someone else. Only one thing is left for us to do. It is nothing but performing the role entrusted to us, making it our best. The real applause comes only when the front curtain falls covering the empty stage. I am trying to live this life, making it my best. The rest is not in my hands. So, least bothered about it. You have ever been an inspiration for me to think better and live better. Thank you, dear. God bless you and your family. Wishing you a very Happy New Year.. Very happy to see you again in your writings. One of the recent days my colleague reminds me the failure of my life who don’t know anything about my struggling and survival of the painful life which I am going through.I was helpless to explain anything and my eyes are filled with tears… your writing reminds me the typical experiences of my life …..
Good to see you back, Alexis. A very happy and a wonderful new year. Nice..enjoyed it..Wishing u a Happy New Year. You could well have been writing about yourself, here! I could be wrong but I see parallels! A Happy New Year to you my dear friend! be well, be happy! The tree is a fine model for surviving in hostile circumstances. The tragedy however is that many never make use of the most helpful circumstances, only to repent at a later date about lost opportunities. The priority in life has to be a small pain today for a long and happy tomorrow. Hi Alexis, I keep checking your blog to see if you have a new post. I used to blog earlier under the pen name Maya Cassis. It’s nice to see your wonderful writing. Takes me back almost a decade 🙂 Good times.